Believe it or not, I have never made Mila a quilt or a blanket. Well, this weekend she gave up her crib to a neighbor and is now in her big girl bed. I figure it was the perfect time to make her a blanket for her new bed. She has an old blanket from when she was a baby that is super soft and cuddly. I am hoping that she loves this one as much that one so she can give it up since its on its last leg. 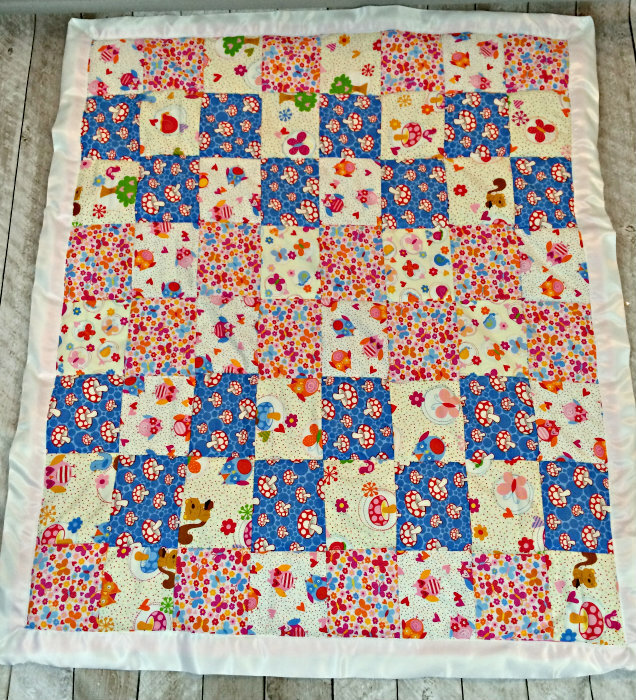 I decided to use a scaled down version of the Easy Patchwork Quilt Pattern I featured on the blog a few weeks ago. I think it turned out ok. 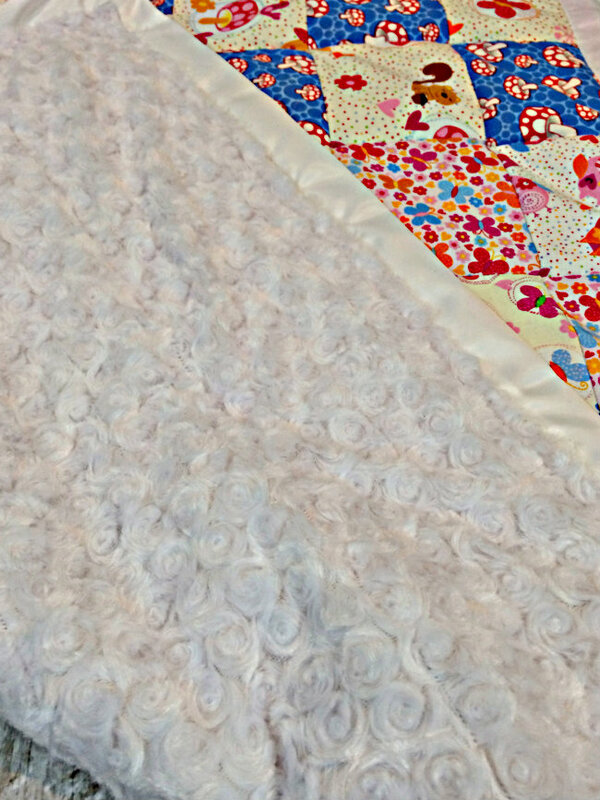 Here is her very first handmade quilted blanket. 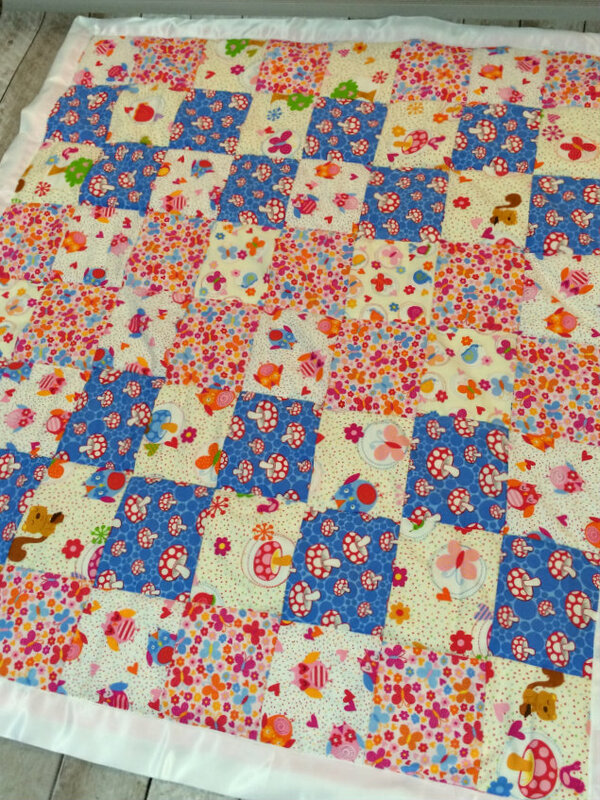 This quilt top took 5 fat quarters. I got a simple bundle at Joann’s. I fell in love with the mushroom blue and decided to feature it in a checker pattern. Mila loves silky fabrics so I used pre-made satin binding for the edges. For the back, I used rosette cuddly fabric. It is super soft and cuddly. It was a bit tricky to quilt with but with some patience, it turned out pretty good. I used warm and natural batting for the center. This pattern is really easy to do and with 5 fat quarters, it makes for a perfect, inexpensive handmade baby gift that anyone would appreciate. Thanks for taking a look and Happy Sewing!